Insomnia is one of the major sleep problems with an estimated prevalence of 10% to 15% in the general population and 30% to 60% in the older population. Moreover, insomnia frequently co-occurs with a wide range of psychiatric disorders, including depression and anorexia. The most widely prescribed agents for the treatment of insomnia are benzodiazepines and non-benzodiazepines, which are central nervous system depressants that enhance signaling of the inhibitory neurotransmitter γ-aminobutyric acid. These medications, however, are plagued by a wide range of adverse effects, including muscle relaxation, rebound insomnia, changes in appetite, next-day sedation, cognitive impairment, amnesic effects, and development of drug tolerance and dependence. A new paper published on October 15, 2018 in the journal Neuropharmacology finds that enhancing endogenous signaling of adenosine A2A receptors may be an alternative strategy for treating insomnia. Adenosine has long been known to represent a state of relative energy deficiency and to induce sleep via adenosine receptors. Although adenosine A2A receptor agonists strongly induce sleep, their adverse cardiovascular effects preclude their use in treating sleep disorders. 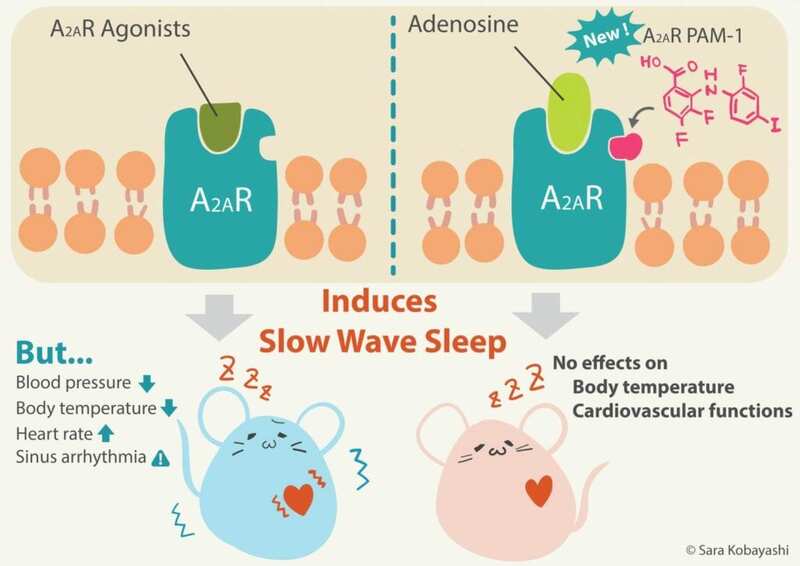 Researchers at the International Institute for Integrative Sleep Medicine (WPI-IIIS) at the University of Tsukuba succeeded in identifying the first positive allosteric modulator for adenosine A2A receptors and demonstrated that enhancing A2A receptor signaling induces sleep that is indistinguishable from the major component of natural sleep, known as slow-wave sleep, as it is characterized by slow and high-voltage brain waves, without affecting cardiovascular function. A positive allosteric modulator may evoke selective physiologic A2A receptor responses because, in contrast to an A2A receptor agonist, its actions are limited to when and where adenosine is released. "We believe that allosteric modulators of A2A receptors may help people with sleep problems to fall asleep" says Mustafa Korkutata, the first author of the paper. Although mice are the most commonly used model organism of human disease, results in mice, however, are often not always reliable for predicting human study outcomes. Therefore, "many obstacles remain to be overcome in generating a novel drug for the treatment of insomnia in humans, but we believe that our discovery will unlock the development of the next-generation sleeping pill." explained medicinal chemist Dr. Tsuyoshi Saitoh, another lead author of the paper. IIIS was launched by the Ministry of Education, Culture, Sports, Science and Technology of Japan with the aim of building globally visible research centers with high research standards and excellent research environments to accommodate globally prominent researchers. IIIS is the world's premier institute aiming to elucidate the fundamental principles of sleep/wake biology, develop new strategies to diagnose, prevent, and treat sleep disorders, and contribute to promote human health through research activities. The research was funded by the Japan Society for the Promotion of Science and the Japan Science and Technology Agency. Bibliographic information: Korkutata M., Saitoh T., Cherasse Y., Ioka S., Duo F., Qin R., Murakoshi N., Fujii S., Zhou X., Sugiyama F., Chen JF., Kumagai H., Nagase H., and Lazarus M., (2018) Enhancing endogenous adenosine A2A receptor signaling induces slow-wave sleep without affecting body temperature and cardiovascular function.